Probably my favorite image from the entire trip...birders wading from the ferry boat onto South Beach. 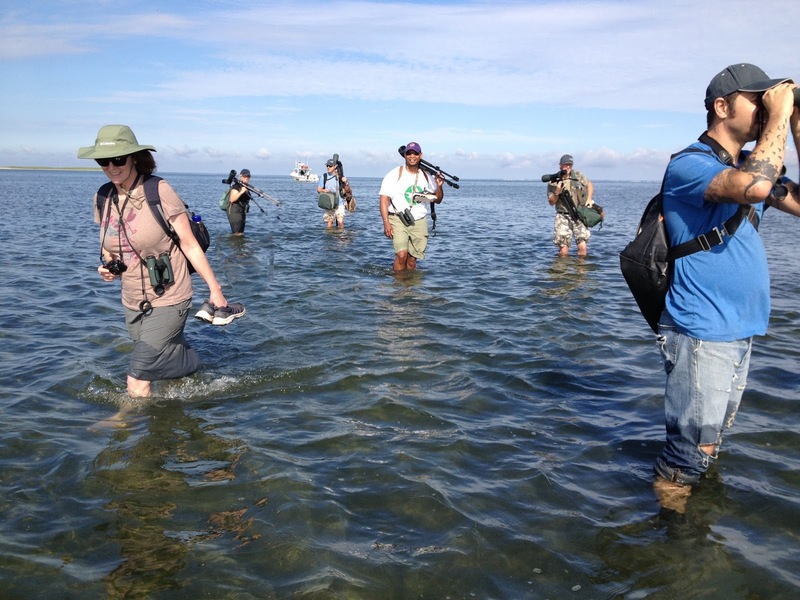 Before we even reached dry land, Drew Weber and Paul Riss were scoping out shorebirds. I think I added four or five life birds before I reached the shore. Scanning flocks of terns with Swarovski Scopes is pretty fantastic. Common Tern with sandling eel. Semipalmated Plover was one of my life birds. A few of these are reported every year in Idaho, but I've never seen them. I've begun to think that it was some big joke with the entire Idaho birding community conspiring against me as I dip on them over and over and over again. But now I've seen hordes of them. They were so abundant that they became a junk bird within a very short amount of time. I suppose now that I've broken this personal curse I'll start seeing them regularly in Idaho. Isn't that how it always happens? Super digiscopers Clay Taylor and Sharon Stiteler calling me from down the shoreline making sure I was seeing the Common Eiders...another life bird. I had indeed seen them. Yay! Horseshoe Crab husk. Horseshoe crab eggs are a primary food source for migrating shorebirds. Horseshoe crabs are also a preferred fish bait so were over harvested and impacted shorebird populations. From what I hear, horseshoe crabs are now recovering in population and so are the shorebirds that depend on their eggs. The husk looks like it might have inspire Star Trek's Klingon's appearance. We saw lots of their shells in all sizes. Hopefully a good sign. Black-bellied Plover - diagnostic photo digiscoped from a long-long way away. Several Ruddy Turnstones were not just turning stones, but were excavating deep into the sand after food. Fun to watch as other shorebirds came and gleaned critters from the excavated sand. Snowy Plover - another lifer! Much of the island is cordoned off to protect nesting habitat for these cute little endangered plovers. We saw several of them. What a treat! Lots of huge Gray Seals and several smaller Harbor Seals. Great fun to see for this Idaho boy. What do you think the tern on the left is? Short-billed Dowitcher - another fun seashore bird as I see plenty of their long-billed counterparts on mudflats in Idaho. Oyster Catcher W4. I need to find out where and when it was banded. It's great to hear that the Horseshoe Crabs are recovering as hopefully it will mean that the Red Knot population that had plummeted because of their scarcity will recover. Congratulations on all those life birds, and some interesting images. Coming ashore looks like when we visit Mud Islands in Port Phillip Bay near Melbourne, only it looks warmer than when I've done it! What fun to visit the eastern shore and pick up so many life birds!! Good news about the horseshoe crabs. They were so plentiful when I was younger. Wow Robert! That's totally excellent, way to bring home the lifers! It must've been great to team up with so many other great birders and personalities too. Fantastic! South Beach Chatham looks like a fabulous place to view shorebirds. Congratulations on ALL the life birds! Terrific digiscoped images! I was happy to read that Horseshoe Crabs are recovering. Congrats on all the lifers! Good trip! It was fun to meet you on this trip, Robert. These pics bring back great memories!